Now your saying just what are the tracks. Well they are not railroad tracks for sure, but those of my two birds, TWEETY BIRD and BUTTONS. BUTTONS is the newest member of my household. 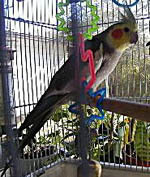 TWEETY is a Cockatiel, gray in color with yellow checks.He has the wolf whistle down pat, along with parts of the song Dixie. He calls his own name, calls the dogs, "come here" along with several other words. Tweety is about 5 years of age now. BUTTONS, is an African grey parrot who was born in September of 2000. I bought him at a Pet-Mart from a local man who breeds them. He was only 4 months old and hand tame, of course the first week I had him and took him out he tasted hunks of my hands!! He started to talk before Easter and calls hello, mama, saying things that tweety also says, started to bark like the dogs, what are you doing and picking up others each week. He thinks he is suppose to eat people food and therefore takes his beak and throws out a lot of bird food demanding what I am eating, spoiled you betcha. I grew up with many animals around. My dad had "Campbell's Bird Land" in Daytona Beach, FL, before in died in 1968. He had over 1,000 birds at that time, that he raised and sold. Growing up in Scranton, PA, while my dad was a policeman, his hobby was raising birds, which soon turned into a profitable business. After his retirement in Florida guess he just had to get back into the birds so they started up a business.